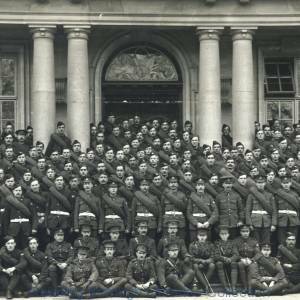 "C" Company, 7th Battalion, Royal Berkshire Regiment, Shire Hall, The Forbury, Reading, 1915. Every effort has been made to trace copyright holders, obtain permission from them and to ensure that all credits are correct. The Reading Borough Libraries have acted in good faith at all times and on the best information available to us at the time of publication. We apologise for any inadvertent omissions, which will be corrected as soon as possible if notification is given to us in writing. In the event you are the owner of the copyright in any of the material on this website and do not consent to the use of your material in accordance with the terms of conditions of use of this website, please contact us at info@readinglibraries.org.uk and we will withdraw your material from our website forthwith on receipt of your contact details, written objection and proof of ownership. "C" Company of the 7th Battalion, Royal Berkshire Regiment, outside the Shire Hall in The Forbury, Reading, April 1915. Black and white photograph; 15 x 30 cm.